The patient presented with significant and increasing pain to hot/cold and biting on #14. Clinical exam reveals deep distal caries beneath a recently placed temporary filling. A small mesial to distal fracture was noted. While the clinical exam and traditional radiographs are suggestive of a cracked tooth, the CBCT clearly illustrates the extent of the fracture. Both the depth of the mesial angular bone loss and the location of the fracture becomes clearly apparent when the CBCT is analyzed. A case like this would traditionally require that the chamber be accessed to inspect the severity of the fracture. 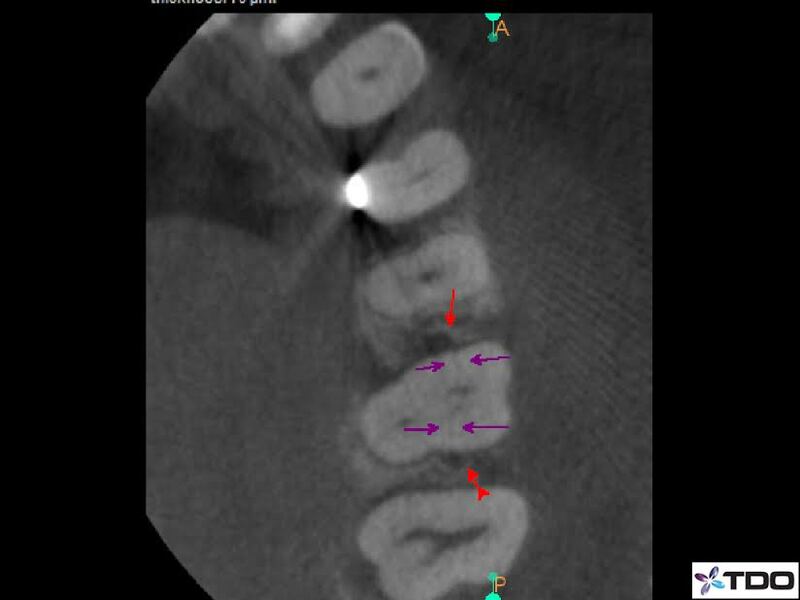 In this case, the decision was made to extract #14 based on the clinical exam and the CBCT findings. The patient presented without pain for evaluation of persistent sinus tract on the buccal gingiva between teeth #13 and #14. The clinical exam revealed no pain to percussion or palpation. No probing depths were noted upon initial inspection. 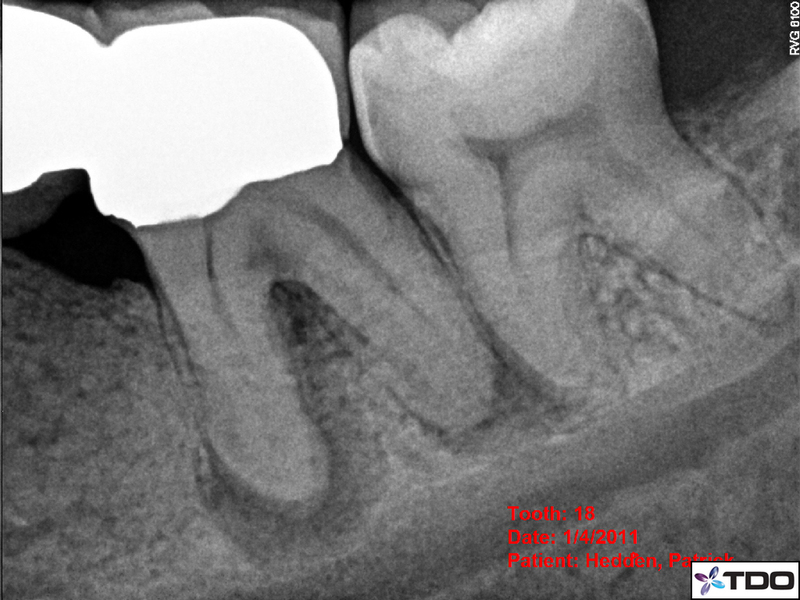 The CBCT clearly identified tooth #14, and specifically the MB root, as the source of the problem. The tooth was probed again with local anesthesia, and an 8mm narrow pocket was identified on the buccal of the MB root #14. The patient chose to have the tooth extracted since the findings were highly suggestive of a root fracture, and the overall prognosis was guarded to poor. The patient was originally seen in 2011 for evaluation of lower left quadrant. He reported a history of pain and swelling in the area prior to taking a round of antibiotics. 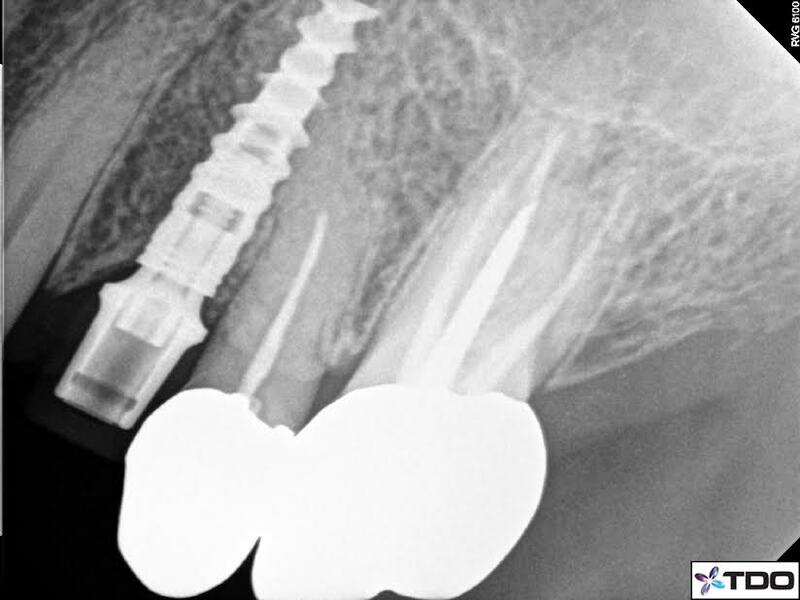 The tooth was asymptomatic at the initial examination, and a 10mm pocket was noted at the buccal furcation. A diagnosis of necrotic #14 with asymptomatic apical periodontitis was made. Endodontic therapy was completed without complication. The patient returned in 2014 with complaint of pain and swelling. 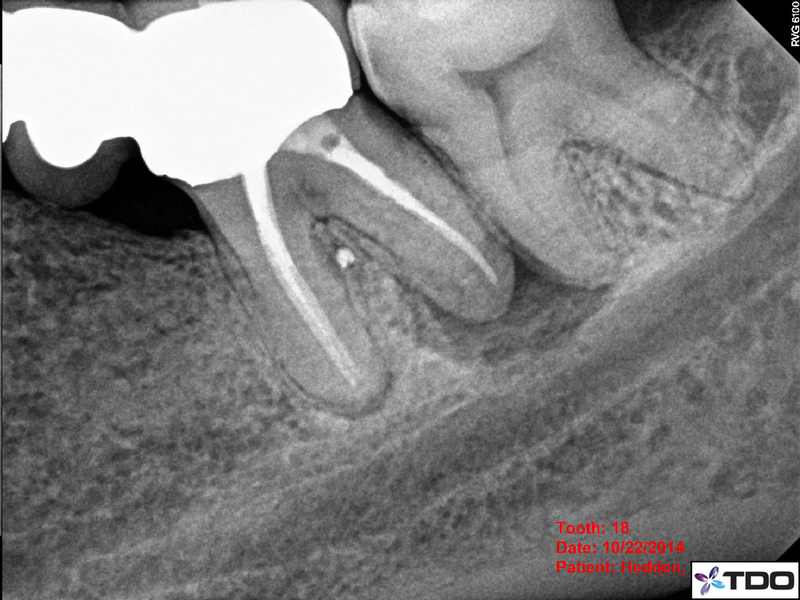 The clinical exam revealed complete healing of the mesial root, including complete resolution of the 10mm pocket. However, The distal root PARL had worsened. 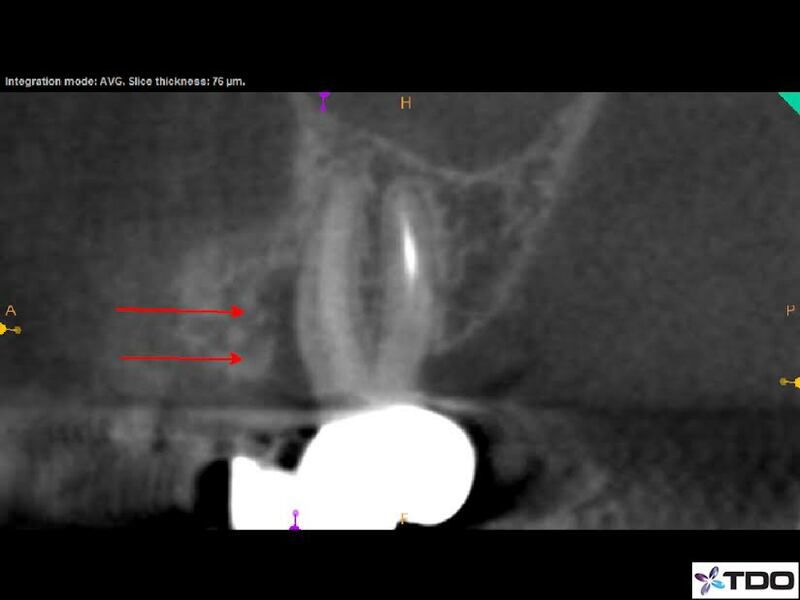 A CBCT scan revealed a DL canal splitting off of the main distal canal in the middle 1/3 of the distal root. 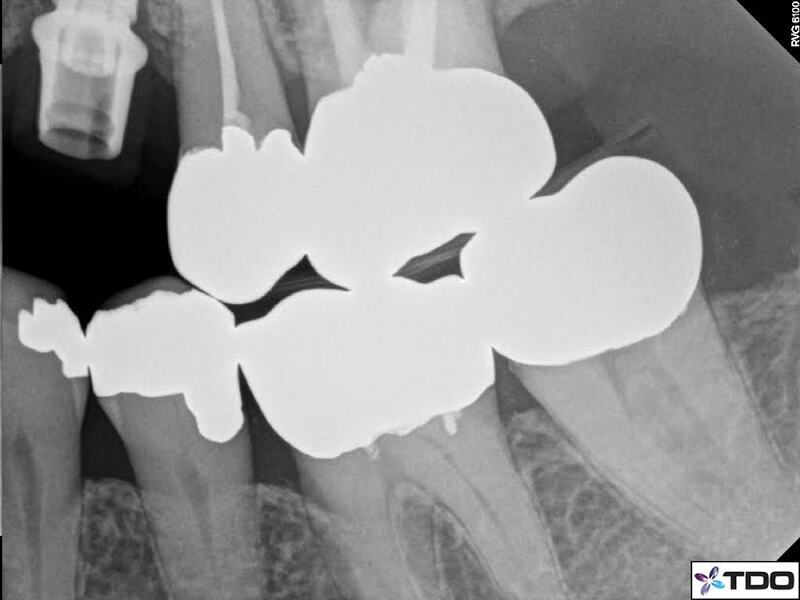 With the aid of CBCT, we were able to locate, instrument, and obturate this canal without complication. In this particular case we chose to retreat only the distal canals as the mesial canals were not part of the current problem. Hopefully, the lesion will be resolved when the patient returns for 6-month recall.